The word ‘Vesa’ (in Sanskrit as also in Oriya) means, dress. It is a common feature with all the temples that deities are dressed and decorated daily. On special occasions the deities are also dressed and decorated in suitable manner. The same is also . 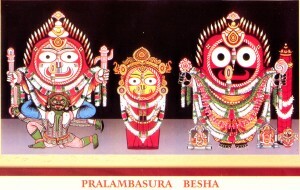 the case with the deities in the Puri temple. There are particular persons belonging to the temple services who know the traditional ways of dress and decoration. Flowers, tender leaves, silken fabrics, golden ornaments etc. constitute the materials with which the deities are dressed. Sandal wood paste, musk, camphor etc. are also adequately used. Out of the several dresses, mention may here be made of only a few. The word ‘Candana’ means sandal wood, the sweet-scented paste of which is applied to the body of the deities in the months of Vaisakha and Jyestha, for long 42 days of Candana Yatra. 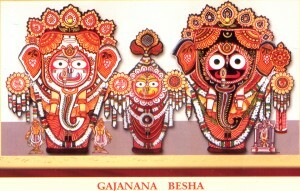 In Snana Yatra Jagannatha is dressed like Ganesa, who bears the head of an elephant (Hati). In the month of Asadha, when the deities are brought back to the main gate of the temple and are still in their respective chariots, the Suna Bhesa (decoration with golden ornaments) takes place. The word ‘Chita’ literally means the decoration of the forehead with special materials like sandal paste, musk and gorachana etc. 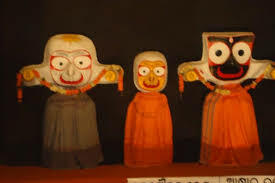 But in Puri three magnificient chitas (ornaments of the forehead) made of gold, diamond, saphire and emerald are put on the the three principal deities on the Amavasya day of Sravana. Connected with this, is the decoration of Rahu Rekha. It is an ornament of the head. This is removed from the head of the deities on the day of Snana Purnima and is again put in the month of Sravana. In the story of Krisna, Kaliya, the venomous viper, living on the banks of Yamuna was a source of great danger to the people and Krisna had killed it. To remind this incident in the month of Bhadra this Bhesa takes place. The actual scene of killing the demonlike snake is dramatised in the sacred tank of Markanda. A demon, Pralamba by name, was killed by Balarama, the elder brother of Krisna. So Balarama wears this Bhesa in Bhadra. The deep impact of the Krisna cult in Odisha is perhaps responsible for this Bhesa. 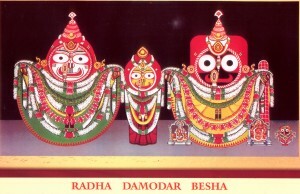 It takes place in the month of Bhadra. 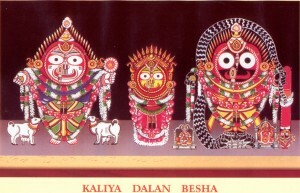 As is clear from the name itself, Jagannatha is dressed like Krisna and Balabhadra like Balarama. 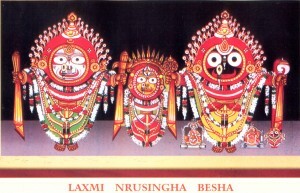 In the month of Bhadra, Jagannatha is dressed like Vamana incarnation of Visnu. Visnu had appeared in the form of a Vamana (a dwarf) and through his ingenuity, outwitted the demon king Bali and pushed him down to the inferno with his foot. The word Raj a means a ‘king’. Hence this Bhesa denotes the dress of a sovereign king. 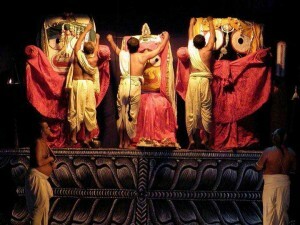 Jagannatha was regarded as the king of Odisha since the rule of Ganga dynasty and this Bhesa of Jagannatha continues from those days four times in a year. This Bhesa takes place in the months of Asvina and Kartika. Radha is the female counter- part of Krisna. Damodara is one of the names of Krisna. 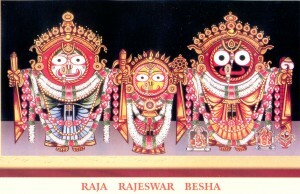 This Bhesa, therefore, highlights the great religious integration that took place in the Jagannatha temple with regard to the episodes of Radha and Krisna. 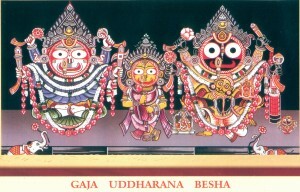 When the Radha Damodara Bhesa of Jagannatha continues, wehave the Harihara Bhesa of Balabhadra. 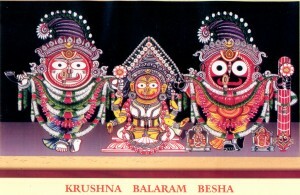 In this Bhesa, half of the body of Balabhadra looks blackish while the other half looks whitish, which connotes that one half of his body is Visnu and the other half is Siva. This Bhesa takes place in the month of Kartika. The worship of Laksminarayana has gained popularity in Jagannathism, since the visit of Ramanuja, the great religious preacher to Puri. This Bhesa also takes place in the month of Kartika. The very name of the dress indicates how the powerful cult of Nrsimha was given due recognition in Puri temple. 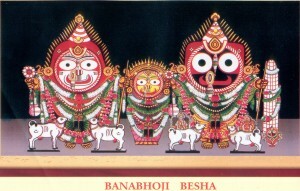 This Bhesa takes place in such years as have six days of Panchuka in the month of Kartika. 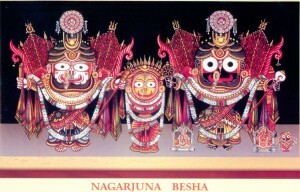 On that occasion Jagannatha is dressed like Nagarjuna (a military general) on the extra day. This Bhesa is also known as the Parasurama Bhesa. 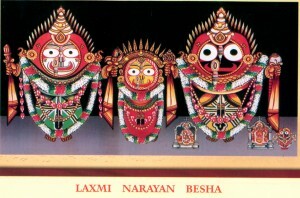 Jagannatha puts on this Bhesa in the month of Margasira for three days. Sraddha means the offerings made out of love and hence, such rites as are observed for the departed parents and forefathers are called Sraddha. In the month of Margasira, Jagannatha performs the Sraddha in favour of Nanda, Vasudeva and Dasaratha. We know that Visnu was born as the eldest son of Dasaratha, the King of Ayodhya and was named Ramachandra. Again his birth took place in a prison in Mathura as the son of Vasudeva from where he was mysteriously taken out and delivered to Nanda (the king of Braja), who nourished him like his own son and came to be known popularly as the second father of Krisna. from this month onwards. This Bhesa takes place to perpetuate the memory of a devotee, who had brought the lotus flowers from a long distance to decorate the god. There is a story in the Puranas that at one time in the past, an elephant was attacked by a ferocious alligator. Finding no other way to save his life, this animal implored the mercy of Visnu. His prayers immediately moved Visnu to compassion and the latter hurled his disc to cut the attacking alligator to pieces. 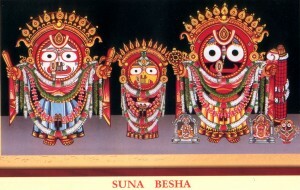 Jagannatha, who is identified with Visnu, wears this Bhesa to inspire a sense of devotion to the grace of the god. 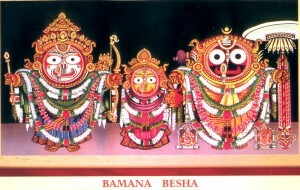 In the month of Phalguna, this Bhesa takes place. According to a social custom prevailing all over India, people play with coloured , powder and throw this powder over the friends and relatives. 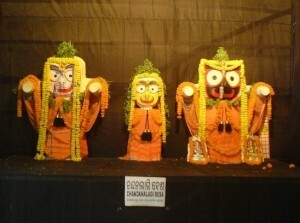 ‘Jagannatha is the best representative of the people and he is also shown as sharing the experiences of the. People by playing with red powder.